How Does the Day of the Week Affect Work Habits? Whether our brains consciously recognize it or not, the day of the week can affect our work habits. Each new day represents fresh opportunity, but are we sabotaging our weekly potential by pigeonholing the work week into commonly accepted stereotypes? Poor Monday! It’s the day of the week that never gets invited to the party. Pragmatic and practical, it has earned the unfair reputation of the weekly “buzzkill.” With the excuse of, “A Case of the Mondays” ready at a moment’s notice, productivity can suffer and slow the start of the week to a grumbling crawl. Instead, try reframing Monday as “The Motivator!” This is your day for big plan plans, ambitious goals and a positive outlook. Don’t think of it as the end of your weekend; think of it as the start of new opportunities! Truth: Tuesday + Thursday = Tricky. Sandwiched between more notorious days with catchier names, these less trendy days seem to get pushed to the wayside. All too often, the events of “T Twosome” are forgotten as mere filler material between the weekly blockbusters. For a change, why not go with “Training Tuesday” and “Thorough Thursday.” Devote some time each Tuesday to professional development – whether that involves job specific training or just picking up a good book. Thursday, on the other hand, can be reserved for reviewing your goals and taking a deeper look into your progress for the week so far. Long before the camel gave it a shout out, Wednesday has had a reputation as the sweet spot in the middle of the calendar. With the beginning of the week comfortably in the rear view mirror and Friday’s light appearing at the end of the tunnel, it can be easy to lose focus. Mix up the middle of your week with “Wellness Wednesday.” Instead of using this day to let productivity dip, get over the hump by making some healthier choices. A few minutes of brisk walking during the 3 p.m. rush or a lunch full of fresh ingredients can boost your workweek! There’s no doubt about it – Friday is cool. It gets to start late, leave early and wear jeans! But while Friday’s popularity keeps skyrocketing, your work may be suffering. Once “Casual” becomes short for “Lazy,” consider transforming the last day of your work week into “Fierce Friday!” With the weekend in your sights, uses the extra energy to power through deadlines, check in with teammates and set up the start of your week for success. Do you have any day of the week habits you’d like to change? Share them below and join the conversation! 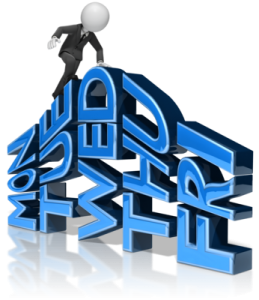 This entry was posted in Currently Employed and tagged Career Advice, days of the week, Fridays at Work, hump day, job advice, job tips, Monday Morning, Monday Motivation, successful Friday, work week. Bookmark the permalink.